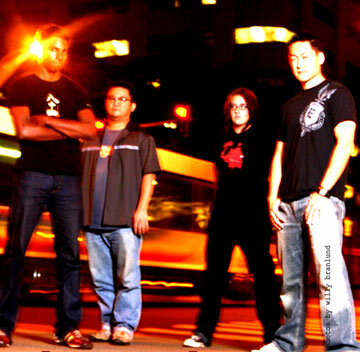 The guys from left, guitarist and backing vocalist Miles Thomas, drummer Randall Ajimine, bassist Christine Palm and lead vocalist-guitarist Martin Kim. Martin Kim thought his band would be the perfect opener for U2's Aloha Stadium concert. That honor, however, went to a pickup group headed by the Irish band's stage manager. But you can hear a bit of the early U2's earnest sound in Harrison. The band's new CD, "Possibilities," is just that -- well-structured guitar rock, buoyed by the title track, the opener "Falling Down," the chiming "Star" and a dynamic trio of songs that close the album -- "Two Quick Steps," "Momentum" and "Before This Night is Over." Harrison headlines a gig Saturday at Waikiki's punk palace, the Pink Cadillac. The band -- Kim, Miles Thomas, Randall Ajimine and Christine Palm -- happen to be Christian, but that doesn't define them. "We're not a Christian band," Ajimine said. "That used to be a distinction that would get bands like ours into trouble with some churches. Thankfully ... that doesn't seem to be as much of an issue anymore. We don't wear our beliefs on our sleeves, but we don't hide them, either." Although Kim said his faith influences his songwriting, "I don't want to preach. I want to write about things that everyone can relate to. Life experiences. Everyone experiences the good and the bad. Depression, betrayal, desire, confusion, love and hope ... everyone deals with those emotions every day." He said his favorite track is "Falling Down." "I'm real proud of how that turned out," Kim said. Ajimine said his favorite Harrison song is "Are You Happy Now." "To me, that song is really where the (band's) sound started coming together -- where the individual musical contributions created something bigger than anything any one of us could have come up with alone." You only have so much time to catch the band at home. "This is the first band I've been in that's been really serious about seeing how far we can go, rather than just being content with just playing gigs here and there," Ajimine said. "That's why we're planning on moving to Seattle in July because, let's face it, you can only go so far playing rock in Hawaii. "I think the coolest -- and the hardest -- part of being in this band is the diversity. We're all so different in so many different ways -- ethnicity, gender, personality and, most of all, our tastes in music. Ask for a list of favorite artists and you'll get everything from Disturbed to Shawn Colvin to The Police to Kenny G. Seriously, we have a Kenny G fan in the group, but I won't say who. "Musically, it shouldn't work, but even in rehearsals, while writing new material, it comes together seamlessly. It's a closet dream of mine that we'll approach the success of other unlikely musical collaborations like the Doors, Fleetwood Mac or the Police." "The best thing about being in this band is learning how to love people that are different from you," Kim said. "Most of us avoid people that are different from us. ... But each of us is working toward a common goal. We know if that we can't get along with each other, we will fail."